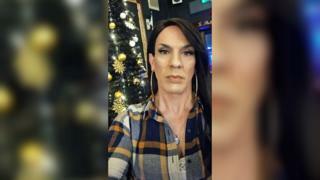 A transgender woman said she "felt humiliated" after a bank froze her account because she sounded like a man. Sophia Reis, from Nottingham, was using Santander's telephone banking service when a member of staff said she could not access her money. The 46-year-old said a customer service adviser later told her the problem had arisen because of her voice. Santander said it has a "duty to protect the security" of accounts but apologised for any offence caused. Ms Reis, who began transitioning in 2016, said she informed the bank of her name change in November. But last Thursday, despite providing all the correct security information over the telephone, her debit card and accounts were frozen until she visited a branch and provided ID. "I felt embarrassed. I felt humiliated because yet again I have to explain myself," she said. "For the first time in my life I felt embarrassed of who I am. "I want for the bank, as an institution, to have something in place where people like myself get protected and don't have to go through this every time." Image caption Ms Reis said the experience was "the last straw"
Ms Reis said a member of staff had now placed a note on her account but said the problem could happen again. "So what is the point if they can't guarantee that I'm not going to go through this again," she said. "I have to make sure that every day no-one can complain about my appearance. I have to always be on the top of my game, always looking over my shoulder because at any point something can happen. "And that shouldn't be the way anybody should live." In a statement, Santander admitted its service "was not as good as it should have been" and wanted all customers "to be treated equally and fairly". It added: "Santander works closely with LGBT+ colleagues and charities to identify the barriers that are in place to access our services."